Ivy is a common ornamental plant in humid, northern climes, but few know that the vine also has great medicinal potential. Often associated with academic buildings and Old World charm, ivy is perhaps the most recognizable vine in the Western world. Despite its prevalence, however, few today are aware of its long connection to human civilization, both as an ornamental plant and as an herbal medicine. Relieving breathing disorders. Preliminary research indicates that ivy may be helpful in relieving symptoms of upper respiratory tract infections (URTIs). Disinfecting minor burns and cuts. Ivy is often used on minor skin wounds to prevent infections. Ivy leaves contain high concentrations of both phenolic compounds and saponins, which are thought to contribute to the plant's medicinal uses. Saponins in particular are likely to be responsible for ivy's antibacterial properties. However, because so little in-depth research has been performed on the health benefits of ivy, the exact mechanisms of action are yet to be known. Additionally, few studies have been able to show statistically significant improvements in respiratory infections when using ivy, but this is not unusual among popular cough medications; many other over-the-counter remedies for URTIs have little evidence supporting their use. Further studies are needed to evaluate ivy's efficacy. Hepatica and marigold also display antibacterial properties and can be used for treating respiratory problems, as well as for disinfecting and healing minor wounds. Most topical and internal uses of ivy are regarded as safe. The most common side effect is contact dermatitis, a type of allergic reaction that occurs when skin comes into contact with ivy leaves. This is most likely caused by a compound called falcarinol, which is found in ivy leaves. Contact dermatitis is particularly likely among people who are already allergic to carrots, celery, or other similar plants. There are no known medical interactions with ivy. Ivy leaves and berries are thought to be toxic to humans in large doses, so they should not be consumed alone; only controlled medicinal preparations of ivy are considered safe. Raw ivy may cause gastrointestinal upset, diarrhea, hyperactivity, difficulty breathing, muscular weakness, lack of coordination, fever, and coma. Because of its bitter taste and its reputed toxicity, it is not recommended to eat any part of the ivy plant raw. IT IS IMPORTANT NOT TO CONFUSE ENGLISH IVY WITH THE VINE THAT IS COMMONLY REFERRED TO AS POISON IVY, WHICH IS NOT A TRUE IVY SPECIES AND CAN CAUSE SERIOUS DERMAL IRRITATION. The best and safest way to consume ivy is in a medicinal preparation, but there are a number of different types of remedies made from the ivy plant. Infusion. To brew ivy tea, steep ivy leaves in hot water for up to 10 minutes and then strain the ivy out. Tea may be taken up to three times daily, and it helps to relieve respiratory ailments. Powder. Ivy powder can be used to make a tea that helps to improve respiration. Poultice. Ivy leaves may be mixed into a poultice and applied to minor skin wounds to protect against fungal infections and promote healing. Tincture. Several drops of tincture can be added to another drink to improve respiratory functioning, or the drops may be added to lotion for the plant's antifungal benefits. Extract. One teaspoon of extract may be taken up to three times a day to reduce symptoms of respiratory illness. Capsules. Capsules are a quick and simple way to help reduce coughing. Still-growing ivy plants can be found year-round at many garden stores or possibly even select grocery stores with garden sections. Seeds for the plant may be bought in the same stores, or they are available online. Ivy supplements can be found at some wholesale retailers and specialized health stores. Many, however, find the broadest variety and lowest prices from online retailers, which offer a wide range of brands. Ivy is a popular plant to use as a groundcover in gardens for its ornamental appearance, as well as a popular choice of indoor potted plant. Its rapid growth makes it a fairly easy plant to cultivate, but be aware that ivy can quickly take over an area and kill other plants growing there, so any gardener planning on planting ivy should be prepared to keep watch over its growth. Ivy is usually propagated by either cuttings or seeds. If the plant is intended to climb, seeds should be planted close to the surface of the soil to provide them the best opportunity. Climbing ivy can be trained to a trellis or a shaped frame. It is recommended to plant ivy in a protected area with partial to full shade. If the plant is exposed to full sun or strong winds, the leaves may begin to turn brown. Ivy plants grow best in fertile, peat-based soil with good moisture retention. The soil should have a pH of 5.5 – 6.5 to promote the best ivy growth. It can be beneficial to fertilize ivy while it is growing, but fertilization should be stopped once growing halts during very hot and very cold temperatures. The ideal temperature for ivy is within the range of 65 – 85°F (18 – 30°C) during the day; at night, the temperature should be cooler, approximately 55 – 70°F (13 – 21°C). Generally, temperatures above 90°F (32°C) result in poor growth. Ivy thrives in zones 4 – 9. Ivy plants should be pruned when they reach six inches (15 cm) in length. Afterward, it is advised to prune the plant every two to three years, unless it is being trained to a trellis or shaped wire, in which case it will require extra pruning. Watching the ivy's progress and pruning it periodically as needed will help prevent the plant from taking over and choking out other species. Ivy can also be grown in pots indoors in order to prevent it from spreading uncontrolled and overrunning the garden. Ivy is susceptible to leaf spot, blight, and stem rot. Some pests that may infest ivy plant are aphids, caterpillars, mites, slugs, and whiteflies. Ivy is a creeping vine that can grow as tall as 98 feet (30 m) if it has adequate support. Ivy leaves have typically three to five lobes that can range in color from silver to yellow to green, depending on the cultivar. The ivy plant can be evergreen or semi-evergreen, depending on how well it is sheltered in winter; if the foliage turns brown in the cold, it will regrow in the spring. The color of the ivy flowers is greenish-yellow, and the berries, which range from purple-black to yellow-orange, provide food for small wildlife, such as insects and birds. Ivy is colloquially called "English ivy" or "common ivy" to distinguish it from toxic plants like poison ivy. Ivy, Hedera helix, belongs to the Araliaceae or ivy family, which is comprised of roughly 254 species of flowering plants spread throughout both tropical and cooler climates, including herbs like ginseng. Three subspecies of ivy have been officially classified: Hedera helix helix grows in Northern and Western Europe; Hedera helix poetarum grows in Southeast Europe and Southwest Asia and features lighter-colored berries; and Hedera helix rizomatifera grows in Southeast Spain and is characterized by its subterranean stems. 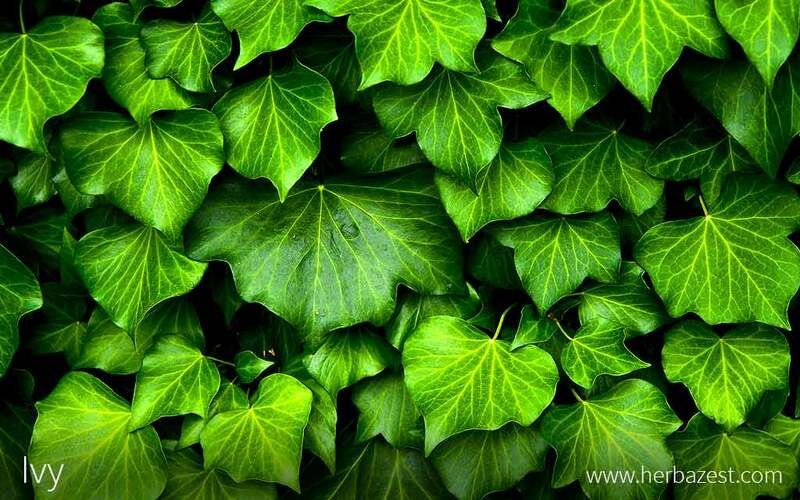 Over 30 cultivars of ivy of various colors and sizes have been modified by humans for ornamental use. Popular strains include 'Glacier' ivy, which features variegated hues on its leaves, and 'Sagittifolia' ivy, which has deeply-lobed leaves. Native to almost all regions of Europe and Western Asia, ivy's wide reach ranges from Ireland to Scandinavia, Portugal to Ukraine, and even extends to parts of Turkey. Ivy has been used for its medicinal properties and its ornamental appearance for millennia, notably in ancient Rome, where it was used in religious celebrations as far back as 200 BCE. A crown of the vine frequently adorned images of Bacchus, the god of wine, who was thought to wear it to prevent intoxication. This tradition became pervasive throughout Europe, and today, many pubs and taverns in Great Britain still have ivy designs incorporated on their signs. Ivy was introduced to the Americas by European colonists as early as 1727, and it is now considered an invasive plant in the United States and Canada, as well as in Australia. Statistics show that roughly 68% of the United States is overpopulated with the plant. Ivy is not an economically important crop; moreover, deliberate cultivation of ivy is actively discouraged in many regions - particularly in the Pacific Northwest region of the United States, where overgrowth has produced "ivy deserts" that drive native species out of huge swaths of land. For this reason, no economic data exists concerning ivy. In traditional European herbal medicine, ivy was believed to cure a number of conditions, including easing liver, spleen, and gallbladder diseases, as well as muscle spasms, gout, and joint pain. Because of its use in ancient Rome, for many years, it was also popularly thought to counteract effects of alcohol. The most common use of ivy is as an groundcover plant, though its cultivation is less common in recent years due to the vine's strict maintenance requirements. Many locations oppose its growth due to its rapid spread, though it is a common sight on university campuses in North America and Europe alike. Although better known as an ornamental, ivy possess medicinal properties that make it useful as an herbal remedy. It is best known for its ability to relieve respiratory difficulties, and it is likely to become more popular as more research investigates its health benefits.